"I used to be challenged by pie crusts. After 27 plus years of experimenting, this is the MOST successful recipe that I have developed. If using salted butter, reduce salt to 1/4 teaspoon." Measure butter & shortening onto a plate, put into freezer for about 20 minutes. Measure cake flour, all-purpose flour, sugar, salt and baking powder into the bowl of a food processor. Pulse for a few seconds to mix. Take 1/2 of the cold butter and 1/2 of the cold shortening, put into processor with dry ingredients and pulse off and on for about 1 minute. Scrape down twice while doing this. Take remainder of the cold butter & cold shortening and cut in very briefly with the processor, leaving visible pea-sized chunks. Do not over process at this stage! In a measuring cup, mix egg yolk and vinegar together, add ice cubes and water. Let this get chilled, about 3 to 4 minutes. Remove mixed flours and shortening from processor, put into a large mixing bowl. Sprinkle approximately 4 to 5 tablespoons of this egg, water, vinegar mixture, a little at a time, mixing gently with a fork. The key to this is, you do not want a wet dough, and you do not want to overmix. Place this dough into plastic wrap or plastic bag, chill in refrigerator for a few minutes. (May also be frozen for a few weeks at this stage for future use). Remove from refrigerator and roll out. This makes absolutely the BEST pie crusts. I have won County Fair competitions with this pie crust. Double for making a 2-crust pie. WOW! 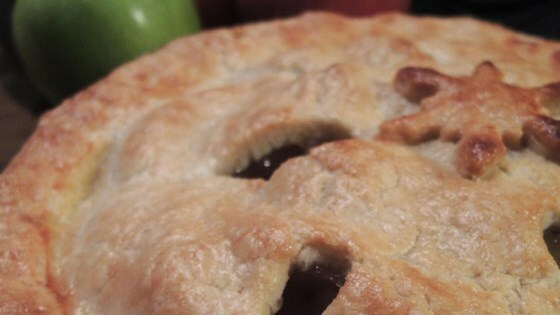 I have been struggling to make a decent pie crust for ages...this is the recipe! It made a good size amount of dough, and the crust was flakey and delicious!